The 150 year old US Capitol building is currently undergoing its first restoration since 1960. The famous domed building is packed with rusted ornamental cast iron elements and a host of hazardous materials. 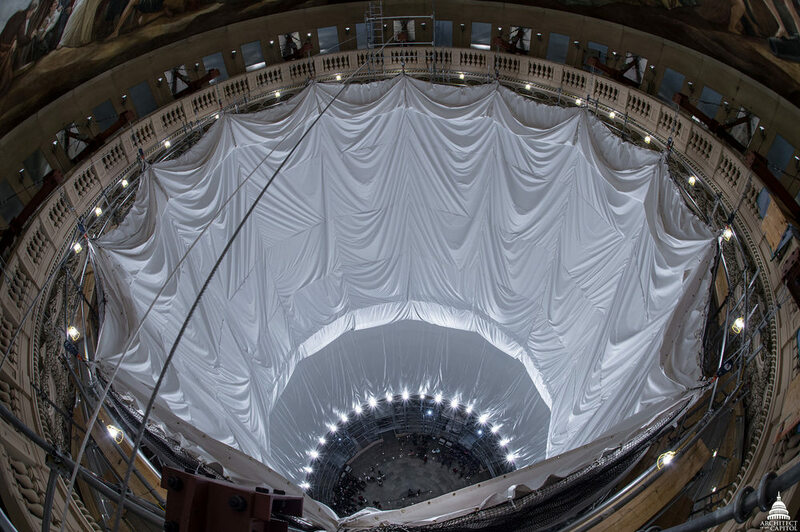 The Architect of the Capitol has posted periodic updates of its progress throughout the project and the latest is a pretty cool timeline of the scaffold installation on the interior side of the Capitol Rotunda. You can find out more about the $100 restoration project in our previous post about it by clicking here. As you’ll see in the video, the crews have begun hanging white drapery on the scaffold as the crews begin to remove hazardous lead paint, restore the iron work, install new lighting, and upgrade the HVAC system and electrical. After the video, we’ve shared a few of the amazing up close pictures of the Rotunda restoration, as well as an inside look into how the replacement windows were made in roughly the same manner as they were in 1860. Many of the historical cupola windows have been badly damaged over the course of the last few decades and needed to be replaced. Obviously, there aren’t going to be many 1860 style windows on the market, so they had to go with the next best thing: re-creation. The original windows had a wavy surface texture which were added to the hot material as it was being rolled out. Both the original and new windows are made of glass, but the new replacement windows have been coated in a polyurethane resin which improves the durability of the glass. Enjoy the video below.